Pinpointing whether your aging clients are presenting with normal age-related cognitive/memory decline, mild cognitive impairment or beginning Alzheimer’s disease is crucial to providing effective interventions that can dramatically improve their safety, mobility, independence and quality of life. 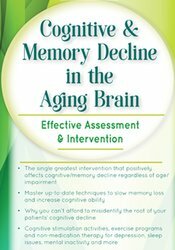 Often overlooked, many co-morbidities and reversible factors can complicate the proper identification of the problem at the root of your client’s cognitive/memory decline—leading you down a frustrating treatment path that fails to get results. The negative implications of misaligned client assessment and treatment interventions are far too important for you to be uncertain and unprepared. Assess the limitations and strengths of the most commonly used cognitive assessments to inform client’s level of functioning. Utilize an assessment tool that quickly determines a client’s ability to retain new information. Implement effective treatment interventions, including Computer-Based Cognitive Training, in the management of memory/cognition decline. Characterize at least six conditions/co-morbidities that impact cognitive/memory function and design intervention strategies that with remediation, may lead to an improvement in cognition/memory ability. Implement effective functional intervention strategies that will have an impact on a client’s functional cognitive/memory status as well as ADL/IADL independence. Computer-based Cognitive Training: What does the evidence say? Nurses completing these self-study materials will earn 6.3 contact hours. Expires: 9/21/2021. PESI, Inc. is an AOTA Approved Provider of continuing education. Provider #: 3322. This self-study course qualifies for 6.0 self-study contact hours or .6 CEUs in the Category of Domain of OT and Occupational Therapy Process. The assignment of AOTA CEUs does not imply endorsement of specific course content, products, or clinical procedures by AOTA. Course Level: Intermediate. Expires: 9/21/2020. This course is offered for .6 ASHA CEUs (Intermediate level, Professional area). **ASHA CEUs are available on this course from 11/01/2018 to 10/31/2023. PESI, Inc. will submit ASHA CEU Requests to the ASHA CE Registry on a monthly basis; ASHA CEU Requests received before 11/01/2018 or after 10/31/2023 cannot be reported. KANSAS SPEECH-LANGUAGE PATHOLOGISTS ONLY: To be reported to KDADS, while completing the online post-test/evaluation, please answer YES to the question: “Are you a Kansas Speech-Language Pathologists?" After completing and passing the online post-test/evaluation, your information will automatically be sent to cepesi@pesi.com to be reported. If you forget to answer yes, please send an email to cepesi@pesi.com with the following information: full title of the activity, speaker name, date of live broadcast, date you completed the post-test, and your name. PESI, Inc., #1062, is approved to offer social work continuing education by the Association of Social Work Boards (ASWB) Approved Continuing Education (ACE) program. Organizations, not individual courses, are approved as ACE providers. State and provincial regulatory boards have the final authority to determine whether an individual course may be accepted for continuing education credit. PESI, Inc. maintains responsibility for this self-study course. ACE provider approval period: January 27, 2017 - January 27, 2020. Social Workers completing this course receive 6.25 Clinical Practice continuing education credits. Course Level: Intermediate. Full attendance is required; no partial credits will be offered for partial attendance. A certificate of attendance will be awarded at the end of the program to social workers who complete the program evaluation. Canadian Social Workers: PESI, Inc., #1062, is approved to offer social work continuing education by the Association of Social Work Boards (ASWB) Approved Continuing Education (ACE) program. Organizations, not individual courses, are approved as ACE providers. State and provincial regulatory boards have the final authority to determine whether an individual course may be accepted for continuing education credit. PESI, Inc. maintains responsibility for this self-study course. ACE provider approval period: January 27, 2017 - January 27, 2020. Social Workers completing this course receive 6.25 Clinical Practice continuing education credits. Course Level: Intermediate. Full attendance is required; no partial credits will be offered for partial attendance. A certificate of attendance will be awarded at the end of the program to social workers who complete the program evaluation. Canadian provinces may accept activities approved by the ASWB for ongoing professional development. COLORADO SOCIAL WORKER PARTICIPANTS ONLY: To be reported to the Colorado Chapter of the NASW, while completing the online post-test/evaluation, please answer YES to the question: “Are you a Colorado Social Worker?" and include your license number. After completing and passing the online post-test/evaluation, your information will automatically be sent to cepesi@pesi.com to be reported. If you forget to answer yes, please send an email to cepesi@pesi.com with the following information: full title of the activity, speaker name, date of live broadcast, date you completed the post-test, and your name and your license number.